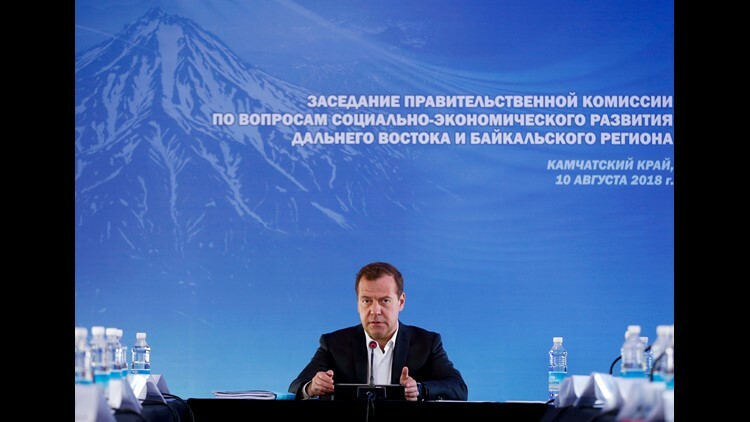 Russian Prime Minister Dmitry Medvedev speaks during a meeting in Kamchatka Peninsula region, Russian Far East, Russia, Aug. 10, 2018. Russia's prime minister warned the United States against ramping up sanctions, saying that Moscow will retaliate with economic, political and unspecified "other" means. Russia's prime minister on Friday warned the United States against imposing new sanctions on Russia and said the Kremlin would view any ban on banking or the use of the dollar by Moscow as a "declaration of economic war" that would provoke a strong retaliation. The comments came as Russian President Vladimir Putin and the permanent members of the National Security Council discussed new possible U.S. sanctions against Moscow, Kremlin Spokesman Dmitry Peskov said, according to the government-owned Tass news agency. Peskov said the council discussed the "new unfriendly steps on the part of Washington, which may take the form of trade restrictions." The meeting’s participants "emphasized the complete illegitimacy of such actions from the standpoint of international law," Peskov added. The State Department said Wednesday that new sanctions would be imposed later this month following Washington's determination that Moscow had used the Novichok nerve agent to poison ex-Russian spy Sergei Skripal and his daughter in the British city of Salisbury. Russia has strongly denied involvement in the poisoning. According to the State Department, those sanctions will include the presumed denial of export licenses for Russia to purchase many items with national security implications. The announcement of new U.S. sanctions has rattled Russian currency and stock markets, sending the ruble plummeting to its lowest level since August 2016 in early trading Friday. Some additional sanctions proposed in Congress include legislation targeting Russia’s state-controlled banks and freezing their operations in dollars. Such ramped-up economic measures, if adopted, would have a major impact on the Russian economy, as reflected by Prime Minister Dmitry Medvedev's sharp reaction. "I would like not to comment on the talks about future sanctions, but there is one thing I can say: If measures like a ban on banking activities or the use of this or that currency follows, this can clearly be described as a declaration of an economic war," the prime minister said Friday. "And this war will have to be responded – by economic, political and, if necessary, other means. And our American partners should realize this." Medvedev said that while the U.S. said the sanctions are intended to punish Russia’s “bad” behavior, their goal is to sideline a rival. “It’s intended to remove Russia as a strong competitor on the international arena,” he said.